Your pal's goal weight isn't so far away—not when you can help your dog reach his ideal weight with Purina Dog Chow Healthy Weight dry dog food. 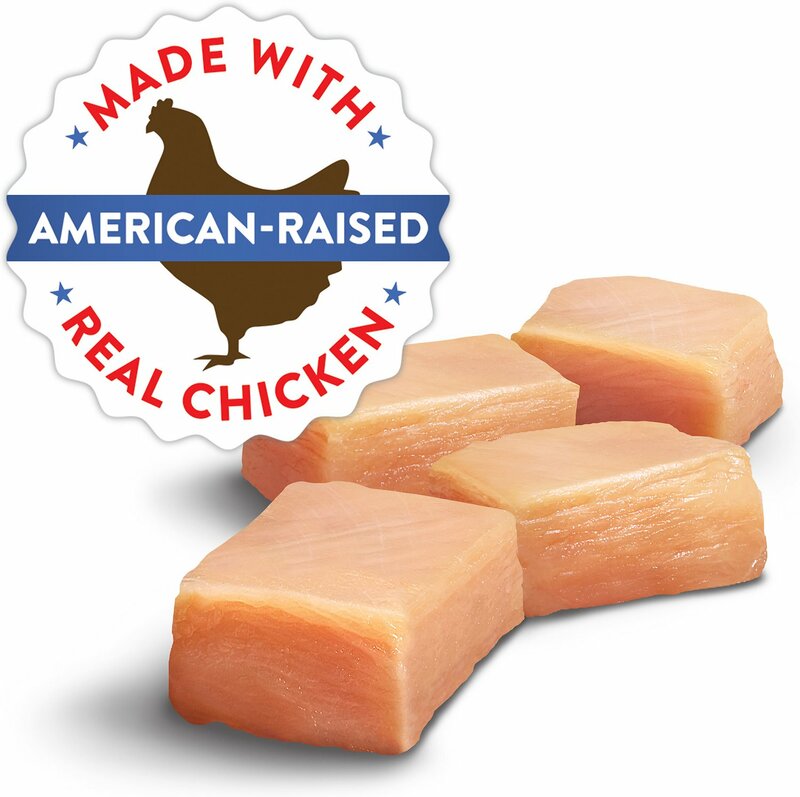 Formulated specifically to help your dog shed those pounds and get to an ideal weight, this recipe is made with real chicken and contains 10% fewer calories than Purina Dog Chow Complete Adult. There's no need to worry if your pal is getting everything he needs; this dry dog food lets you manage his diet while still giving him all the nourishment he requires. A blend of soft chunks and crunchy kibble gets him excited about dinnertime, and you can smile as he happily chomps away because you know he's getting a meal backed by a trusted brand. 100% complete and balanced food, helping adult dogs live a long healthy life. This recipe contains high-quality protein like real chicken which helps your dog maintain strong muscles. A highly digestible recipe allows your pet to absorb nutrients including essentials vitamins and minerals that help keep them going. 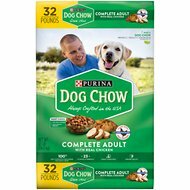 10% less calories than Purina Dog Chow Complete Adult help with weight loss or weight maintenance. The unique combination of tender chunks and crunchy kibble create an inviting texture for your pal to enjoy. Whole Grain Corn, Soybean Hulls, Soybean Meal, Meat And Bone Meal, Whole Grain Wheat, Soybean Germ Meal, Corn Germ Meal, Egg And Chicken Flavor, Corn Gluten Meal, Chicken, Animal Digest, Turkey By-Product Meal, Animal Fat Preserved With Mixed-Tocopherols (Form Of Vitamin E), Glycerin, Salt, Calcium Carbonate, Choline Chloride, Vitamin E Supplement, L-Ascorbyl-2-Polyphosphate (Source Of Vitamin C), Red 40, Zinc Sulfate, Sulfur, Ferrous Sulfate Yellow 5, Blue 2, Manganese Sulfate, Niacin, Vitamin A Supplement, Copper Sulfate, Calcium Pantothenate, Thiamine Mononitrate, Pyridoxine Hydrochloride, Vitamin B-12 Supplement, Garlic Oil, Riboflavin Supplement, Vitamin D-3 Supplement, Calcium Iodate, Folic Acid, Menadione Sodium Bisulfite Complex (Source Of Vitamin K Activity), Biotin, Sodium Selenite. D-4122. Amounts are recommended for an average adult dog with normal activity. Remember food intake requirements vary depending on age, activity and environment, and should be adjusted accordingly. 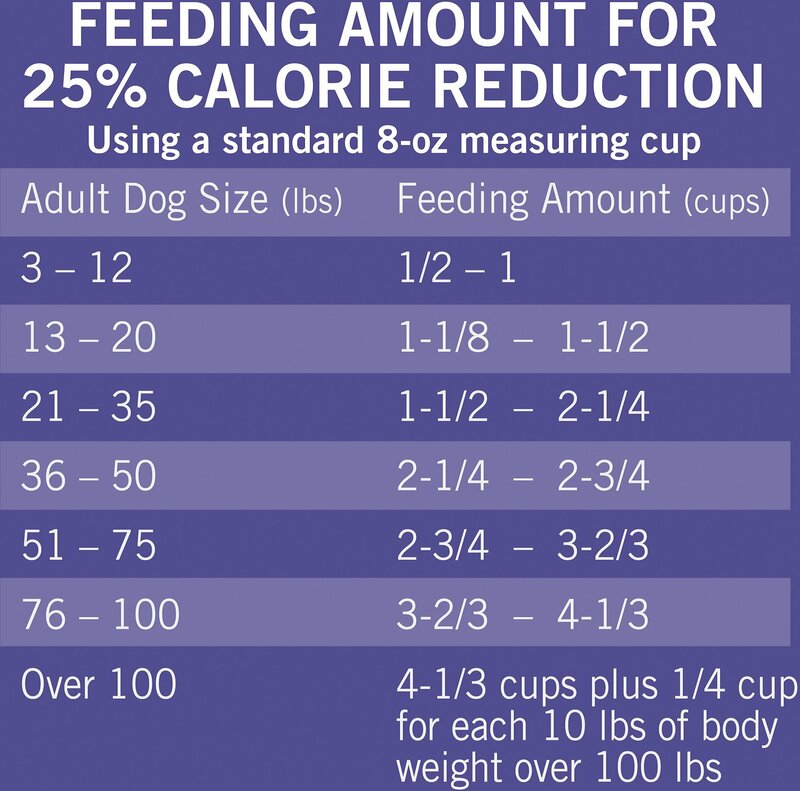 Follow some of these simple guidelines, and you can have success too: Always measure your dog's food servings based on the chart shown. Split your dog's daily allotment into several small meals per day. If you feed treats, give your dog only one or two snacks/day that are low in fat. Exercise moderately. Record your dog's weight each week to monitor your dog's progress. Slow, steady weight loss is ideal. Please allow 7 - 10 days for the transition. Gradually add more Purina Dog Chow Healthy Weight and less of the previous food to your pet's dish each day until the changeover is complete. This gradual transition will help avoid dietary upsets. Dog Chow's top priority is to produce nourishing dog food that will make your pup stronger both mentally and physically. Using their unique Total Care Nutrition approach, Dog Chow offers recipes that are specially formulated to complement every dog's lifestyle and age. Their family of products feature formulas with complete and balanced nutrition in every bag, as well as different flavors, kibble sizes and textures to accommodate your dog's preference. Every product in the Dog Chow family is carefully crafted in the USA using a blend of quality ingredients designed to provide whatever your dog may need to live a long and happy life. In every bag of Dog Chow, you will find 100% of the essential nutrients necessary to support a healthy and active pup, as well as high-grade protein sources to help build strong muscles. Besides the great taste dogs are sure to love, every recipe is also highly digestible. Give your dog the nutrition he needs, naturally. Dog Chow Natural is an affordable natural food that is made with real chicken and provides 100% complete nutrition in a great- tasting kibble. Nourish your pet with added vitamins and minerals, like biotin, which will help maintain the look and feel of your pup's skin and coat. Manage your dog's unique needs with Dog Chow's great-tasting formulas designed for dogs who may need a special diet. There is a kibble formula designed for small dogs, large dogs, weight maintenance and picky eaters, so you can feel good knowing your dog's nutritional needs are taken care of at mealtime. Dog Chow's total care approach and range of products tailored to your dog's life stage can also help your dog be the best he can be at any age. Purina Dog Chow believes that strong dogs make stronger families. Ever since 1926, Dog Chow has been producing dry dog food products that are crafted with care in the USA and feature superior ingredients to provide Total Care Nutrition for your pup. They take pride in their range of products, because the food they make isn't just for their customers, but for their dogs, too. I first got this for one of my dogs who particularly needed to lose weight, and as long as I could keep her out of other food, the pounds came off. I eventually switched all of my dogs to it (3 of the 4 could stand to lose weight), and they clearly prefer it to others. I especially like the big bags because they are more practical and also seem to have more of the large morsels that are my dogs’ favorite. My dog began to STINK from this food. Had to bathe twice as often to keep stink down to a dull roar. Once I stopped feeding this food to him, no stink. I do NOT recommend this food unless you wash your dog daily. Our dachshund puppies love this food! I use to have to put vegetables, treats, etc to get them to eat "high end" dog food but they absolutely love this food as it is and it helps with other issues they were having with other foods. I came to chewy because the stores were no longer carrying this food type. Now after my first auto shipment chewy is no longer carrying this type. My dog enjoys this food. 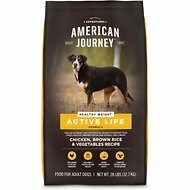 This is a great dog food that my dog maintains his weight with. Great tasting and great stool with great energy. My dog is overweight and per my vet needs to lose quite a bit to take the weight off her shepherd knees. She loves this food with the chunks of chicken in it the best. I tried her on a few different foods, but the Healthy Weight was the one. It seems to stay fresh, even when someone forgets to clip the bag closed! Although it's hard with her sticking her head in the bag every time it's time to refill her food container(! ), she has steadily been losing for awhile now and we'll keep her on it for maintenance once we get there. My dog loves this food and I was happy to order through Chewy.com. He is happy, everybody is happy.